The new Vaio Z Flip 2-in-1 takes direct aim at the MacBook, offering features Apple's laptops can't touch. When Sony sold off its Vaio PC division last year, its new investors didn't look back. The rebooted Vaio brand's crazy out-of-the-box thinking started with its Vaio Z Canvas, which packs hardware no other “tablet” attempts. Now the company is back with a flipping different 2-in-1 laptop. The Vaio Z Flip is a 2-in-1 with a flipping screen. At first glance you’d think the Vaio Z Flip was a standard clamshell, unless you noticed the seam on the back of the screen. To convert to tablet mode, you simply slide a switch at the base of the screen and flip the screen back along that center seam, where magnets hold it in place. Other 2-in-1s have you flip the entire screen all the way around, but feeling a keyboard on the back is a major turn-off for many consumers. To convert to tablet mode, you flip the screen over and fold it shut. The Vaio Z Flip certainly isn’t the first time the design has been used. When Vaio was still with Sony, it made a 15-inch version of the Z Flip using Intel’s Haswell CPUs. The new Vaio Z Flip is the first time it's been done with a 13-inch screen, though, and with modern guts. Here’s where it gets interesting. 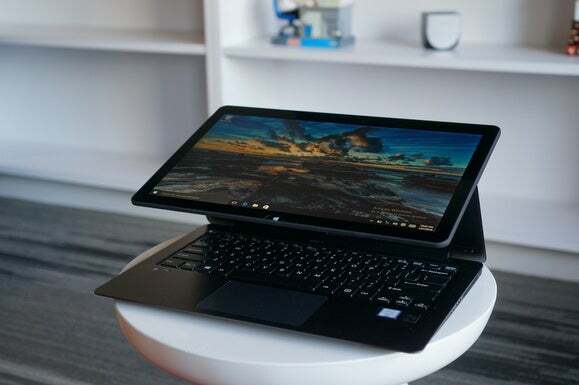 Most 13-inch Ultrabooks or 2-in-1 devices typically use lower-power 15-watt CPUs. Microsoft’s Surface Book, for example, features a 15-watt Skylake chip. Here’s a better view of the screen flip in action. On the bottom is the current generation Mac Book Pro 13. With the Z Flip, Vaio said it wanted to put more oomph in it, so it designed it around the hotter 28-watt Skylake chip. Vaio says the Z Flip should offer performance better than Apple’s MacBook Pro 13 yet weigh the same as a MacBook Air 13. Both of Apple’s laptops—which Vaio is targeting openly—still use the older Broadwell CPUs. The MacBook Air features a 15-watt CPU, while the MacBook Pro uses a 28-watt chip. To amp up the Z Flip a little more, the company said it's also designed a built-in manual boost mode that will run the chip at a higher temperature when needed. There’s no compromise in storage, with an M.2 NVMe SSD inside. For memory, the laptop can be bought with up to 16GB of RAM. 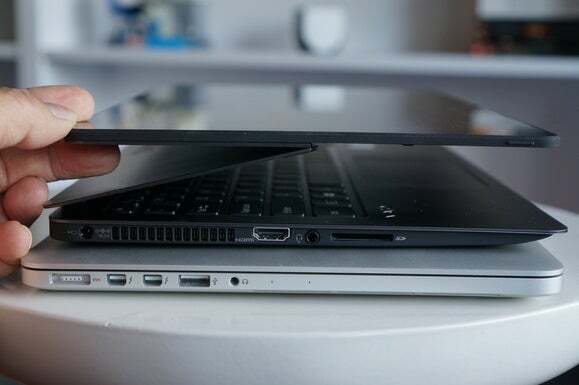 The Vaio Z Flip features the “Z Engine” which means the motherboard has been miniaturized to allow for a larger batter. 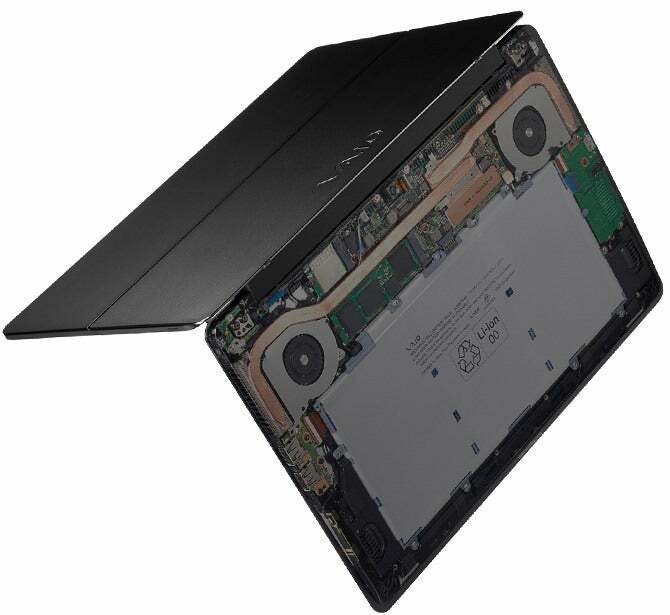 While I question the battery life on the Vaio Z Canvas given its 45-watt quad-core Haswell CPU, the company thinks it can get 11.5 hours thanks to its new “Z Engine.” That’s Vaio’s fancy way of saying it miniaturized the motherboard in the Z flip to allow for a larger battery. 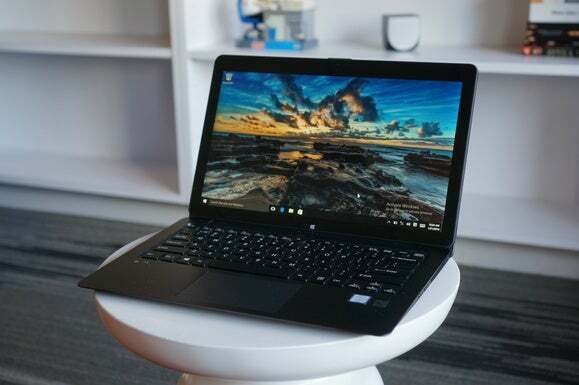 Vaio said it could do this only because the machinery used to make the motherboard is normally reserved for making denser motherboards for smart phones. By using those same machines—the Z Flip is made in Japan—it could make far smaller boards. Externally, Vaio put some nice touches into the body. The top lid is aluminum, while the bottom is carbon fiber. Vaio also uses an anti-Dorito coating on the keys to fight greasy smudges. The base unit with a Core i5, 8GB of RAM and a 256GB SSD starts at $1,799. That’s a big step up from a typical 2-in-1 such as HP’s Spectre X360, which starts at $899. The Vaio Z Flip doesn’t force you to paw the keys when in tablet mode. 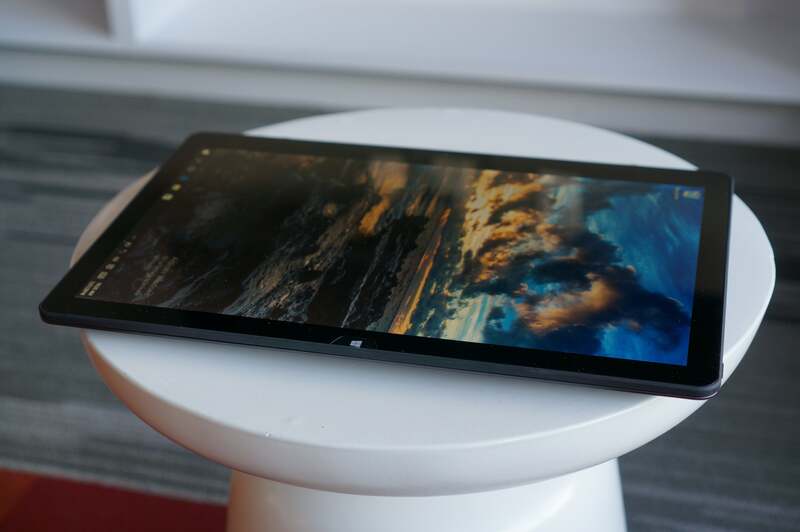 For those who don’t want the extra expense of the tablet mode, the company is also offering a clamshell version. It loses the flip touchscreen and pen, but it retains the 28-watt chip for higher performance. Those units will start at $1,499 with 8GB of RAM and a 256GB SSD.